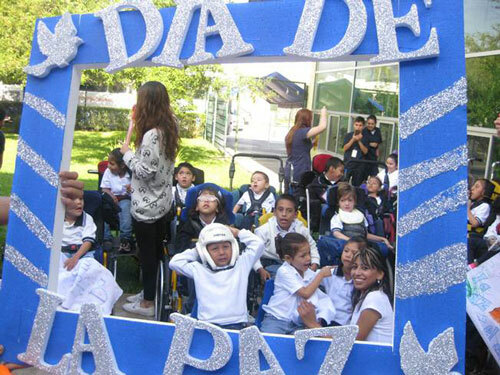 Specialised Orthotic Services have been working with Medict, the Mexican Disabled Children’s Trust since 2007. 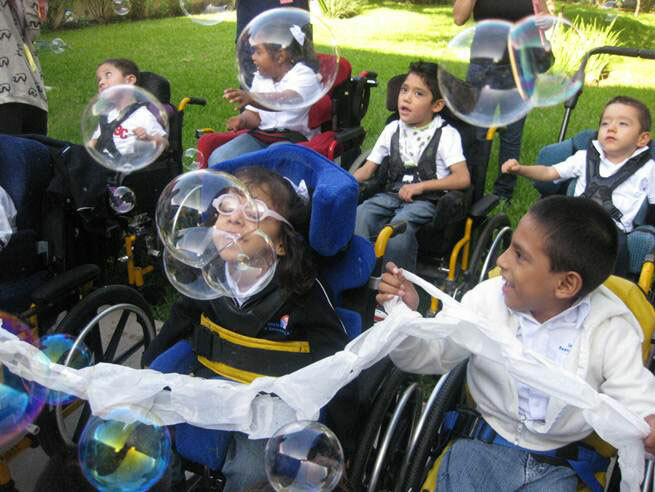 Our continued support has helped make a massive difference to wheelchair services for severely disabled children in Mexico. 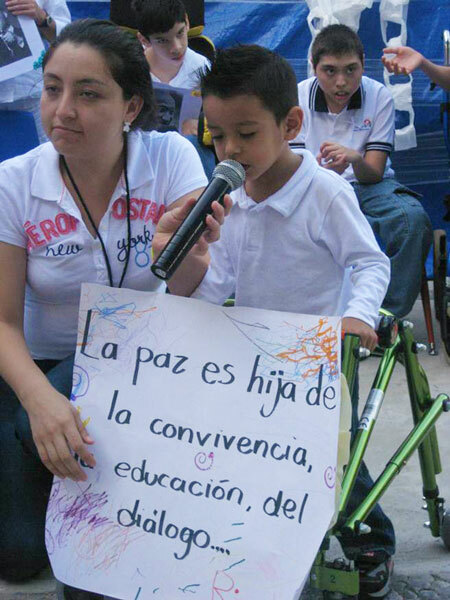 SOS are proud to have helped fund containers of donated specialist seating equipment for Mexico’s poorest children. We have also Worked in partnership with the Instituto Nuevo Amanecer (A.B.P.) in Mexico to develop their own seating service and manufacturing facilities as well as operating clinics and training clinicians. The Staff and Children at the A.B.P. have been celebrating world peace day in the last week of September with celebrations taking place in their assembly last Friday. Consuelo Ibarra sent us a letter of thanks along with some photos from the day. The staff shared with the children some of the biographies of peacemakers throughout the month of September, on the celebration day, elementary students represented each peace maker with quotations from some of these people. The day was concluded with a dance full of bubbles to the beat of ‘imagine’ (Translated using Google Translate). 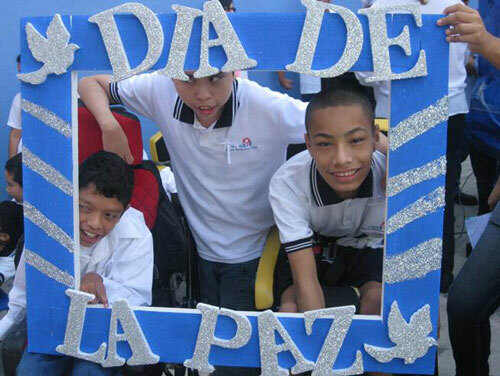 I hope this e-mail finds you all very well and knowing that you have our children from Nuevo Amanecer in your hearts, I am sending you these pictures from our assembly from last Friday where we celebrated World Peace Day. So many good things are happening for our students and their families, and so much of this is thanks to each and every one of your so generous and professional contributions. I hope you enjoy these pictures of them as much as we did during the assembly! 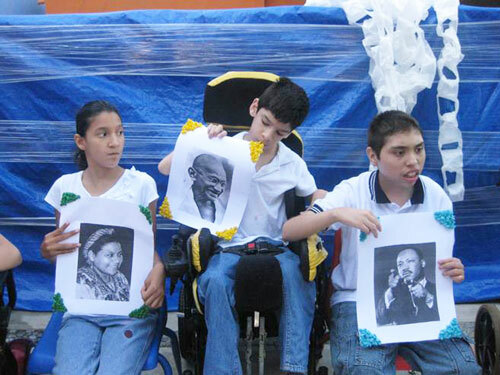 The kids holding pictures of the inspirational peace leaders. For more information please visit the Medict website or contact SOS.